Each summer students in our French and German programs take flight with their trusted professors to immerse themselves in a foreign country and culture while perfecting their language skills. In July, 10 students said “au revoir” to the farm-town style of Pullman to live in the busy city of love for six weeks. During their time, students enjoyed themselves while experiencing Parisian culture, and adjusted from driving themselves around Pullman to taking the subway to get around the center of Paris where class was held. Clinical Assistant Professor Insook Webber has traveled to Paris for about 20 years. Her experience with French culture and language allows the students to attain a deeper understanding and experience of Paris. 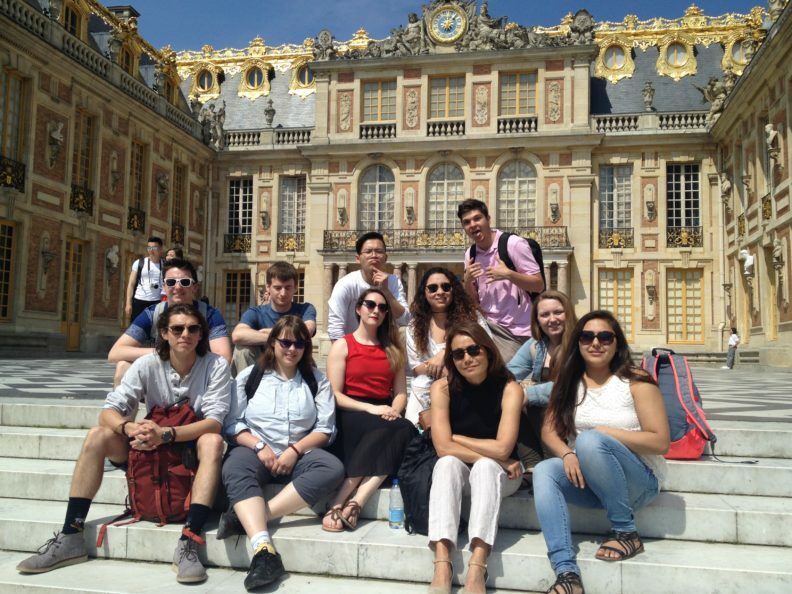 When students went on excursions, they toured the Chȃteau de Versailles and reflected on the beauty of Paris in the Hall of Mirrors. They walked along the promenade of the Seine river, gawked at the original Mona Lisa in the Louvre Museum, and went on many other adventures to cathedrals, museums, and chȃteaux in the city. Students discussed their experiences within the classroom for four days each week. The remaining three days were full of outings within Paris or outside the city. Students put into practice their French language skills each day by speaking with Parisians. By the end of six weeks, they were able to comprehend what French people were saying to them. It was similar to a family dynamic in that there were an equal number of men and women, which Webber quite enjoyed. She said when people are in college it is the perfect time to be traveling abroad because there aren’t any distractions, like worrying about getting a job or getting into graduate school. This once-in-a-lifetime experience solidified their love of the French language, culture, food, traditions, and lifestyle. Webber looks forward to next summer’s adventures with another great group of students! From the tiny college town of Pullman to the foreign city of Vienna, 15 students took a chance and dove into a new country full of Austrian culture, traditions, and history. 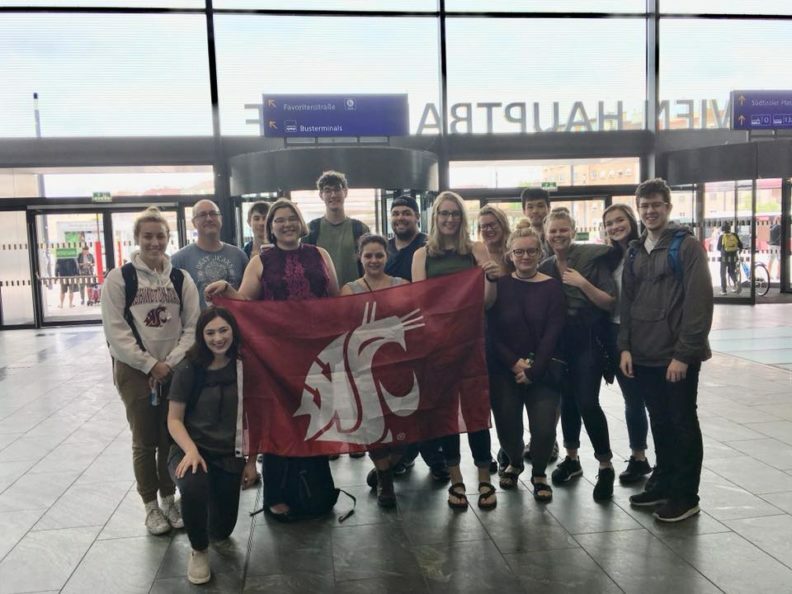 Former WSU Professor JT Hughes led the trip, having traveled to Germany many times in his lifetime and even lived there in his earlier years. For four days each week, students took a train to the center of Vienna, where class was held. In the classroom, students were surrounded by aged rosewood on the walls and floors. Their classroom was a great place for tapping into Austrian history because it was within an old palace. On their three-day weekends, students were able to adventure on their own, either in the country or to other nearby countries. “Going to places like the Schönbrunn palace really helped make the history we were learning about in Austria feel real, and having time to explore the city and cities around it on my own or with friends allowed the experience to be customized to what I wanted it to be,” student Sidney Westenskow said. Of the many things students enjoyed, some were the weekend adventures, historical buildings, learning about royal people, and the goodbye banquet that was held in Vienna’s town hall, Rathaus. Student Morgan Adams remembers learning about Empress Elisabeth of Austria, who is also known as Sisi. Students soaked in the history of Sisi’s death while they visited the museum. While Morgan delved into the royal history, she naturally strengthened her German speaking skills because she had daily practice. Sidney also noted that her knowledge of the language dramatically increased. “I know that without my study abroad experience, I would not be excelling in my German the way that I am,” Sidney said. Before departing, they attended a goodbye banquet for one last Austrian celebration dressed to impress in their ball gowns and suits. They learned a traditional Austrian dance, the quadrille, at the banquet. Commonly performed at midnight, the quadrille involves four people who dance to five movements, and ends with people galloping under an arch way formed by people’s arms. “The joke was that none of the Austrian people know how to dance [even though] they were taught this, but it’s kind of like our version of square dancing…so everyone’s giggling and laughing because they forgot how to dance it as well,” Morgan said. During the quadrille, there were at least 100 people in three rows, which made the galloping-arch a five minute exercise from one end of the ballroom to the other. By the end of their time in Austria, students had discovered multiple other countries during their three-day weekends. This unique experience left students feeling more confident in their speaking skills, more knowledgeable in customs and traditions, and ignited in their passion for lifelong learning of the German language and culture, especially the food! Clinical Associate Professor Joshua Bonzo will continue this program following Hughes’s departure, heading to Berlin, Germany, next summer. Bonzo’s summer in Berlin program will continue with Instructor Karen Jennings. Both educators look forward to next summer’s experiences! For more info, visit our study abroad page!